Research team member Caroline Abunge at a meeting with a mixed group of fishers and traders introduces one of four future scenarios. These scenarios demonstrated tradeoffs by exploring how different groups of people might fare better or worse under different possible futures. The paper shows how economic performance and ecological condition of this fishery can be improved by reducing fishing pressure. However, the paper also identifies the difficult wellbeing tradeoffs that might underlie such an attractive-sounding win-win. Although reducing fishing effort could improve profits and ecological condition, this would also negatively affect total food production, and the livelihoods of certain stakeholders such as women traders would be harmed by a reduction in the landings of small, cheap fish which they buy and sell to local consumers. This case study on the outskirts of Mombasa, is framed by the psychology concept of ‘taboo tradeoffs’, which helps us think about the kinds of values that underlie tradeoffs. In a nutshell: we don’t like to think about certain kinds of tradeoffs between deeply held societal or moral values such as equity, and more straightforward values such as profit or productivity. This can reinforce our tendency to focus on win-wins and ignore inconvenient truths of tradeoffs. This is a problem because ignoring tradeoffs can lead to policies or interventions that either harm poor or marginalised groups, or that fail because they are sabotaged by people whose interests are traded off. We used a range of participatory tools including scenarios and interactive system models to communicate and explore tradeoffs with community members, local NGOs and government personnel. 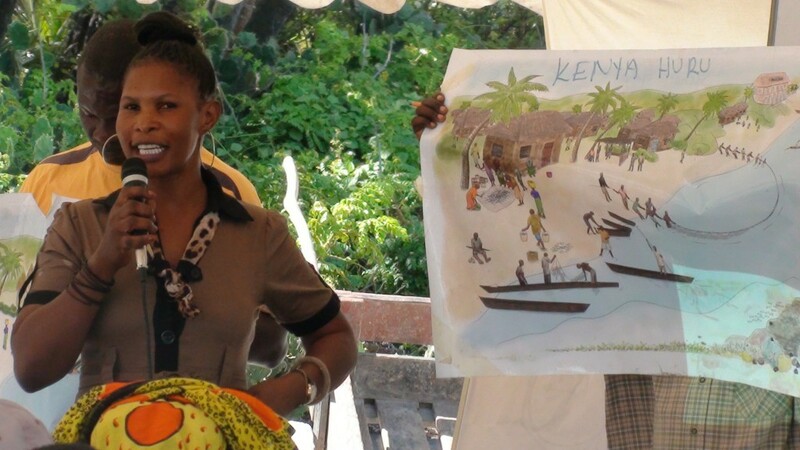 This paper results from a previous project also funded by ESPA called ‘Participatory modelling of wellbeing tradeoffs in coastal Kenya (P-Mowtick)’. This project was a precursor to SPACES and piloted an integrated social-ecological study of coastal ecosystem services that explicitly studied how they contribute to wellbeing of different people. This innovative participatory approach of P-Mowtick informs the design of our stakeholder dialogues and impact strategy in SPACES. 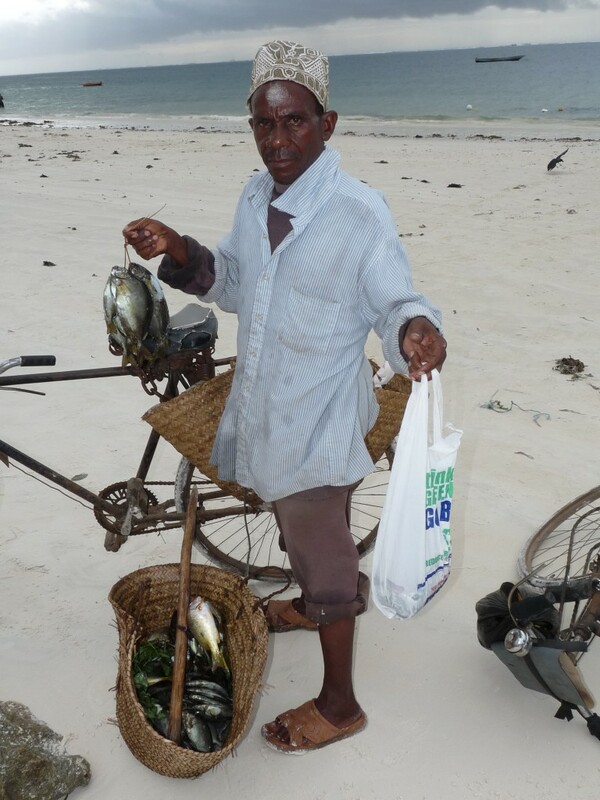 A male trader with his fish bought from a spear fisherman. Male traders have more resource, such as this bicycle than female traders and specialise in higher quality fish like these shown here. – First, rather than a study of fisheries in a single location, SPACES is exploring multiple ecosystem services in multiple sites, including other provisioning services like mangrove pole production, but also regulating and cultural services such as carbon sequestration, shoreline protection and place-based identity and pride. This is vital to understand how ecosystem services are bundled together, and how particular environmental or poverty alleviation interventions lead to tradeoffs between ecosystem services and the people who benefit from them. – Second, while P-Mowtick advanced the science of ecosystem services and wellbeing, through in-depth qualitative research with small groups (link), in SPACES this kind of research is combined with locally-grounded indicators in a survey of over 1000 coastal inhabitants about whether and how their needs are met. This allows us to capture both subjective and objective aspects of wellbeing, and better understand how they are affected by ecological change. – Third, P-Mowtick identified the tradeoff between lots of small fish or fewer large and more valuable fish, but there are still few data on who actually gets to sell and consume different kinds of fish. SPACES helps to fill this gap through our value-chain analysis work (currently being completed) and household fish consumption data from our survey. – Fourth, we built on and learnt from the participatory dialogue approach developed in P-Mowtick with a wider range of stakeholders, and more facilitation expertise in our first stakeholder workshops in both Mozambique and Kenya (see the reports from these workshops here). The next set of workshops will be held in September and will aim to advance beyond identification of trade-offs to identification of policy levers to enhance the wellbeing contribution of coastal ecosystem services.